What Exactly Is a Sushi Love Competition? Apart from a title that sounds like the name of a wacky game show, we mean. Well, to put it simply, we would like you to invent a new kind of sushi. And by a new kind of sushi, we mean something that has never been seen before, but has flavours that you think would work well together. 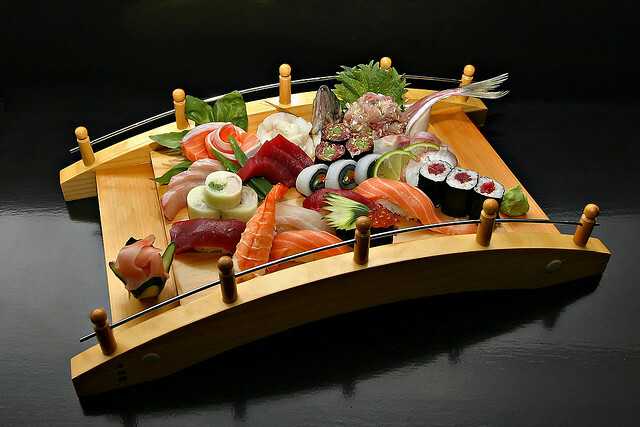 For example, what about a kind of sushi that combines Japanese and Indian cuisine? Or perhaps a sushi that uses Japanese ingredients not normally associated with sushi? Or how about a type of sushi that could be eaten for dessert? Whatever it is, we want you tell us about it, and extra points may or may not be given if you attempt to make this amazing new sushi yourself and send us a photo of it. Our expert team of Japan Centre judges and critics will then choose the best entry, and that contestant will win our wonderful prize. What Is This Prize of Which You Speak? 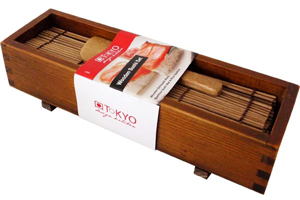 The winner of our competition will receive a fabulous CNB Wooden Sushi Press with Rice Paddle and Rolling Mat; an extremely handy device for making oshizushi (pressed rectangles of rice with salmon or other such fillings on top) and makizushi (sushi rolls). This is a great piece of equipment for any sushi maker or sushi fan to have, and since we only have one to give away, we want to make sure it goes to the most promising sushi inventer we can find. This Sounds Amazing! How Do I Enter? To enter is easy! All you have to do is leave a comment below this entry, or on either our Facebook or Twitter with the hashtag #JCSushiLove any time before midnight on Sunday 24th August, detailing your sushi idea. You can also include other details, such as photos (if you do try to make this sushi for yourself), drawings, or indeed recipes, because if we like your idea enough, we on the panel might want to try and make your fabulous sushi too! After the submission deadline has passed, the Japan Centre judging panel will gather around, put our thinking bandanas on and pick a winner. We will then announce our winner here, on Twitter, on Facebook, and along the nearby city streets. We will then privately message our winner by whichever medium they used to submit their entry, and arrange to have their lovely new sushi press sent to them. All right sushi chefs and conjurers! Enter those sushi mindsets and get inventing! Thanks to KimonoClub, ric_w, Pedro Moura Pinheiro and TMAB2003 at Flickr for the sushi images. We are pleased to announce that the Sushi Love Competition winner was Kit, whose original entry, photo and recipe for her incredible haggis sushi can be seen in the comments below. Take a look at Kit breaking out her fabulous new sushi press! And when you’re done with that, take a look at Kit’s other amazing bento box ideas and be inspired! Posted in Uncategorized and tagged competition, cooking, sushi. Bookmark the permalink. Matcha/Tamago Onigiri!!! The Tamago would be green! Refresh your taste palate between courses with a ‘ shiso-sprinkled rice roll with an umeboshi centre ‘. Mixed Grill Maki Roll Sushi with a bacon, egg, mushroom and tomato filling! A Japanese and English fusion :)! You can put any filling which are kimuchi, umeboshi, row fish, deep fried seafood, edamame beans, even try sweet filling if you try bit more adventurous (^o^) inside sushi rice, you can also chose size, S, M, L.
Because I believe Onigiri is Japanese soul food! If you can excuse the original date on my entry I submit “haggis & black pudding katsu makizushi”. The idea was spawned to celebrate this years Burns Night/Australia day (with a BBQ, naturally). The sushi filling also included oak leaf lettuce, spring onion and pickled gherkins to counter the richness of the katsu. For the katsu: set aside a small haggis – crumb the half that will be used. Mix in a beaten egg white into the haggis. Cut a small amount of black pudding into 3-5mm cubes and carefully fold into the haggis mix – use just enough to ‘speckle’ the mixture. Roll thin sausage shapes with the haggis/black pudding and refrigerate for about 1/2-1hr. When ready to deep fry, heat vegetable oil to about 180°C and prepare plates of plain flour, beaten egg and breadcrumbs. Carefully roll the haggis & black pudding sausages in the flour, then egg , then breadcrumbs and fry in small batches until the coating is golden brown. If the cooled katsu is too thich, halve or quarter them lengthways for sushi filling. For the roll: slice pickled gherkin and the green part of a spring onion into thin matchsticks. 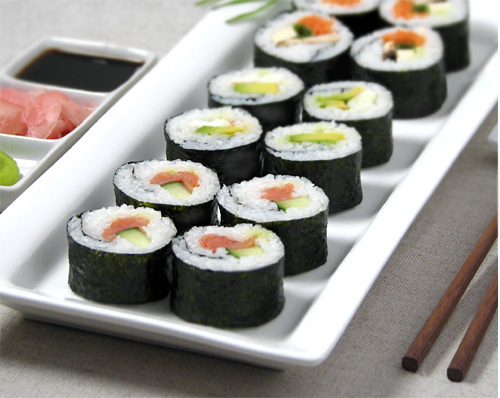 Place enough lettuce leaves on the sushi rice to go along the length or the roll and put the katsu and gherkin pieces on top. 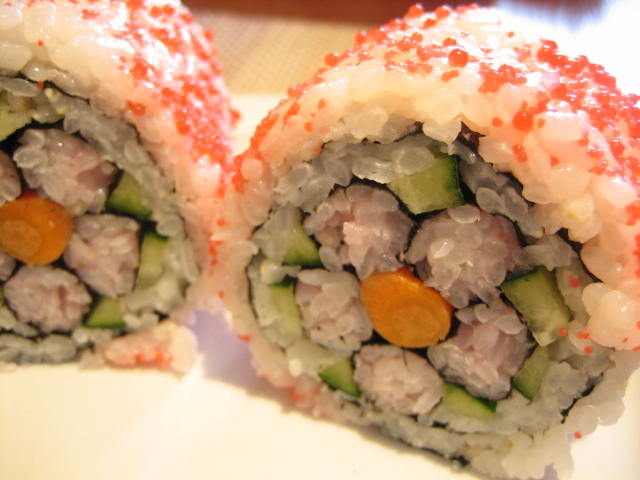 If the leaves are a little wide, roll the lettuce with the other fillings inside before completing the maki.